Is Marriott the redheaded stepchild of Points & Status seekers? Is Marriott the redheaded step-child of Points & Status seekers? (Ed. Note: I wrote and scheduled this before the onslaught of the 70k Marriott Rewards Premier offer “expiring soon” – I didn’t even know when the offer would be going away). “Hi, I’m Trevor, and I am a Marriott Platinum member of 5+ years.” I say that tongue in cheek, but really, if you look at the blogosphere, I think you would be hard pressed to see much love for Marriott, except for the 70k miles after $2,000 spend in three months (and not nearly as much as you see Hilton mentioned). More out of sheer curiosity, I tweeted to some of the titans of BoardingArea, Lucky and Gary. Why is it that @MarriottIntl seems to be a red headed stepchild for points bloggers? @Saverocity @OneMileataTime @garyleff ? @tmount Like most hotel cards it’s worth keeping for anniversary benefits. But return on everyday spend is weak. About the Marriott Rewards Premier Credit Card. Right now the offer is 70,000 Marriott Rewards (MR) points after $2k spend. We’ll get to what that actually gets you in a moment. But lets talk about the credit card earn that Lucky and Gary mention: Anniversary benefits – Category 5-night, and 15 Elite Qualifying Nights (EQNs), that’s why I keep it. You also earn 5 points per dollar at a Marriott, 2 points on travel (airfares from airlines, rentals, and restaurants). On the face of it, that’s really not bad of an earn rate–in a vacuum. The real problem is Marriott’s award chart. First lets look at the redemption chart. You’re looking at 7,500 to 45,000 points a night at a Marriott property. But wait, there’s more! You can also stay at Ritz-Carlton Hotels. Ritz-Carlton Hotel Redemption Rates with Marriott Rewards Points. 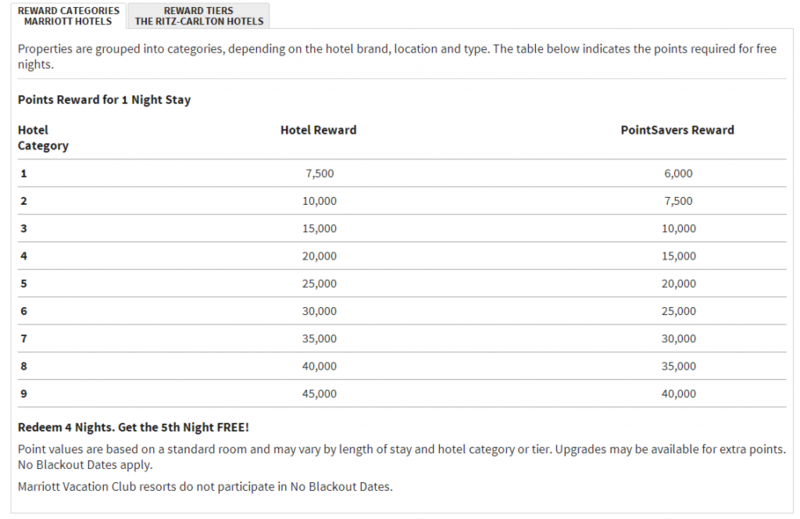 So now we’ve gone from being able to get 9 nights with that 70,000 sign-up bonus, to potentially a single night. It’s pretty rough, but, I’m not sure it’s the roughest, but I’d have to refer to the monumental work that Scott at HackMyTrip has done. Many highlight the super high requirement to maintain top tier status – a whopping 75 nights! Yes, you read that right, 75 nights in a Marriott to get top tier status. I’ve had top tier status since 2009, so I am going on 5 years. It is quite the commitment, but I can’t say that I have been disappointed. Last year I didn’t make the nights, but participated in a StarMegaDO, where ironically I met my blogging partner, @JoeCortez, as well as the VP for Marriott Rewards, who did a lot of listening that week. Marriott’s Hotel + Air Package is pretty cool. If you’re the type that spends 7 nights in one place (you might’ve guessed, that isn’t me), you can “convert” a portion of MR points to airline miles, and not just a few. 37 Airlines! 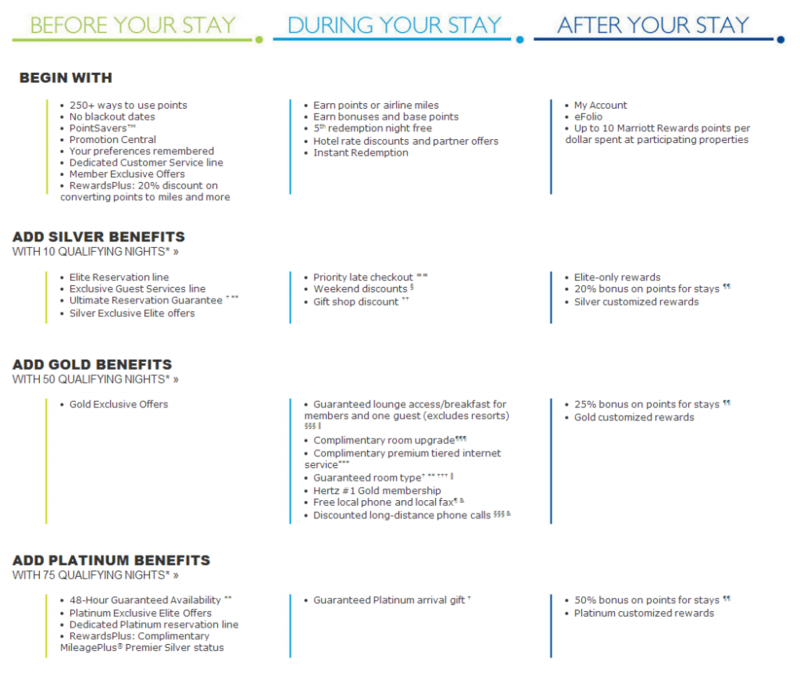 Marriott Rewards Hotel + Air Package 1 Analysis. What this boils down to is, if you’re looking to stay 7 nights at a Marriott Hotel, you’re looking at an even 1-1 exchange for a Hotel + Air Package 1. Avoid Ritz-Carltons! Just a brief review, you can transfer your 50,000 airline miles to Aeromexico, Air Canada, Alaska Airlines, American Airlines, British Airways, Delta Air Lines, Frontier Airlines, GOL/Varig, Hawaiian Airlines, Iberia Airlines, US Airways, Virgin Atlantic. 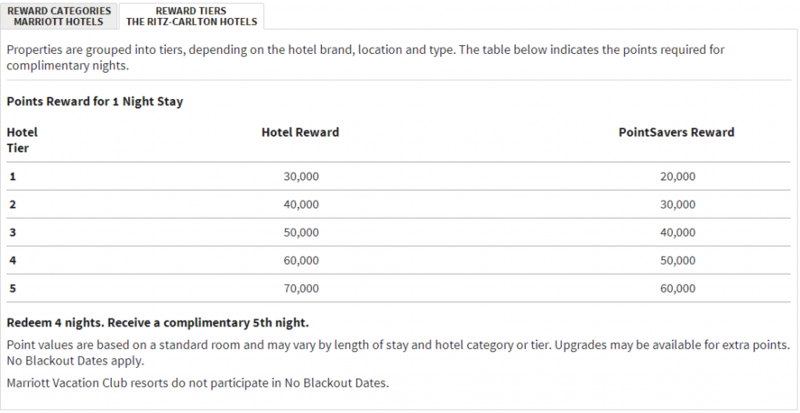 The Marriott Rewards award chart is hard to defend, but I don’t think it really is that out of the ordinary, especially when you consider that top tier Platinum members earn a 50% bonus on points for stays, and if you pay for your stay with your Marriott Rewards Premier card, you get another 5 points per dollar. Ok, not the greatest. I’ll close with this though – Its not as good as the Starwood Preferred Guest (SPG) transfer program, but, I’d say a 1-1 conversion of some Marriott rewards points ups the value, when one has MR points in larger numbers (which, logically, you would if you’re either churning credit cards, or staying 75 nights a year). Maybe it’s symptomatic of a decline in trust in the hobby (following Ingersoll), but I’m loathe to take affiliate bloggers at their word. I’d be curious to know the what the Marriott card pays in commission for conversions relative to other cards. Earning on the IHG card is laughable, but everyone wants and recommends that card, and many hold onto it. I haven’t had the IHG card – do you? How do you like it? If I recall correctly IHG was quite popular back when some of the affiliate bloggers had Royal Ambassador status. But that could just be my perception. The IHG card gives 80K at sign-up, and it’s easy to get another 10K through various means. I’ve never found a place to spend the miles, but I have my eyes set on the Intercontinental in Porto if we ever go there. It’s the free night at any IHG property for the $49 annual fee. There are a lot of IHG properties that cost more than that, so it’s both flexible and valuable. We’re not going to Tahiti for that deal, but we did save about on a last-minute hotel night in upstate NY for an unplanned family event. Once upon a time, it was recommended that you show Chase that you do indeed pay annual fees, and this is a cheap card with which to do so. Earning points on it, however, isn’t worthwhile. Well, using the vacation package with Southwest as the partner, it gives you 120k pts which is good enough for the companion pass. 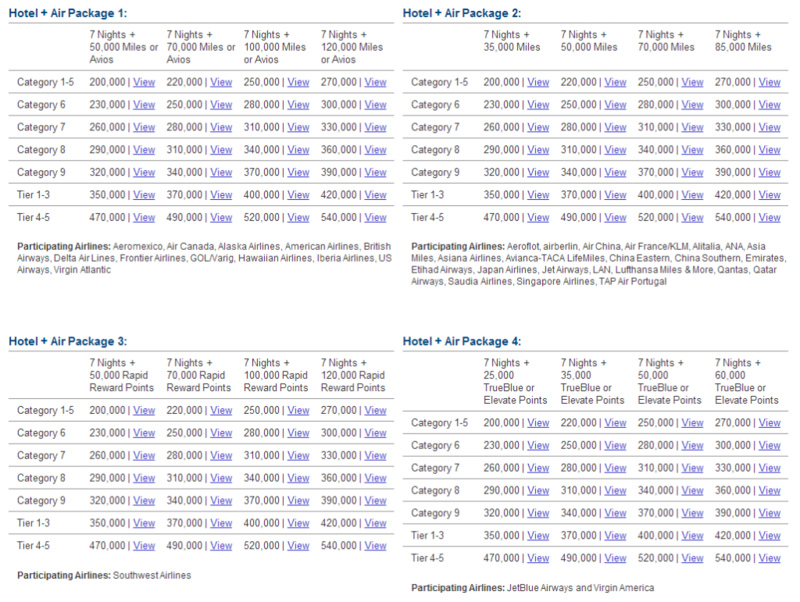 But, one gets 7 nts in a cat 1-5 if using 270k Marriott pts which would be a challenge to find. @harson3, I used my annual nt at Intercontinental in NYC when I had to be there. The $49 annual fee saved me from buying a $300 nt. @JohnnieD – Southwest is a good option for domestic and near-international travel. Not bad especially with the companion pass! While I think a lot of the bloggers you mention are driven almost 100% by affiliate commissions as far as what they recommend, I think people in general talk about the IHG card more than the Marriot because it has a greater potential for outsized redemptions – IE, your 80k signup bonus is 16 points breaks nights, which could be at an intercontinental somewhere. Marriott doesn’t really have that – you are never going to spend 5k points on the Ritz-Carlton anything. @TJ – you make a good point, although I’ll be the first to admit, I am far from an expert on IHG. Marriott does have points savers though, recently I’ve noticed some selective “Flashperks” e-mails, for example, the Marriott Sydney Circular Quay (a category 8) was 20k per night instead of 40k per night. I had the card, but dropped it on the second anniversary. I tend to stay in their properties for my sporadic biz travel and have a kitty of about 250K. I was planning on a travel package redemption, but 2014 and 2015 travel plans don’t include any 7 night stays. I find the hawking of the 70K + 1-4 cert card a bit crazy since you can get the Ritz card with 70K, AF waived and $300 per calendar year of incidental reimbursement. Hard to see a Cat 1-4 and 15 elite nights worth $600 in reimbursements (spread over 2 calendar years). I really need to pull the trigger on that app. @Sesq – yeah, don’t get me wrong, I don’t think the Marriott card is a horrible deal for frequent Marriott stayers, but you make a very valid point on the Ritz card. As I recall, you also get automatic gold status the first year, which is better than 15 elite nights with Marriott (only netting Silver + 5 nights toward the necessary 50 nights). I totally agree with you that most mainstream bloggers ignore the price/value ration of Marriott status. The greatest value in Marriott points resides in the ability to buy back gold status (or platinum for more points, but I’d recommend a soft landing to gold) each year without having to stay 50 nights a year. I’ve never thought to redeem Marriott points for rooms, but it’s not the craziest idea ever. Marriott is the only major program that allows one to maintain 50-night status this way, as far as I know. So with one credit card application one receives nearly 3 years extra gold status following a completed status challenge/match, whichever is available at this time.